Just ME: you made the nice list! 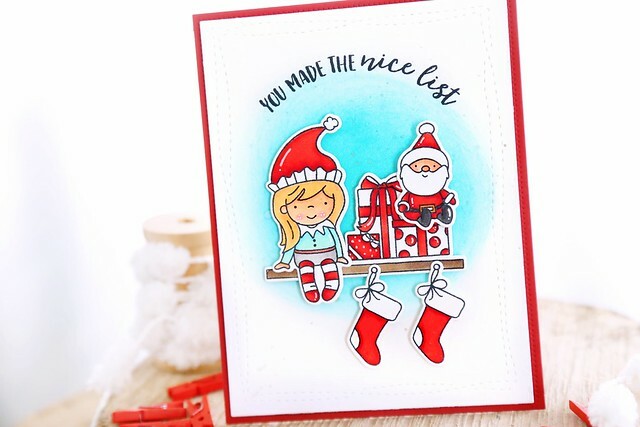 The week before Christmas and I have a few cards I haven't shown off yet, as well as a holiday cookie exchange to make you drool over. That means, posts every day this week! Today's card uses the Neat and Tangled Elfs and their shelf stamp set. I stamped, colored and die-cut everything and just assembled this fuss-free card. I kept things nice and clean by sponging blue ink into a circle, and using that area to ground all of my images. The sentiment was bent to fit the top of the curve. If you want to find me on instagram, search "mom2sofia."